The current limited edition flavor in the Tirol "Mix 8" pack is Castella. Castella (sometimes called kasutera) is a sponge cake adapted from cakes brought to Japan by Portugese in the 16th century. It's especially famous in Nagasaki, which was the only port open to foreign merchants during that time. 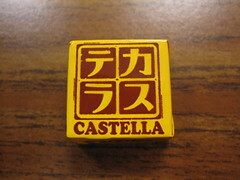 To my American palate, castella always tasted a bit bland. According to most of the recipes I saw online, honey is typically added for flavor and moderate sweetness. For extra credit, I made green tea castella according to this recipe. It didn't come out great, but I think it was because I overmixed the eggs and batter, which led to a very tough, dense cake. The ingredients are quite simple, though, so I'd love to try again soon with a different recipe. 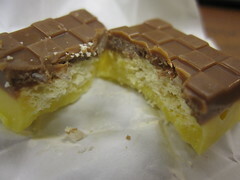 Anyhow, this Tirol was based on plain castella, and the look of the chocolate reminded me of purin or flan. It smelled buttery, but didn't give me a sense of sponge cake. The white chocolate had a sweet, buttery flavor with just a touch of honey. Inside, there was a barely-flavored biscuit to add some crunchiness (like in Tirol's standard BIS chocolate), but there were also large sugar crystals inside. The sugar added a new dimension of texture that I hadn't seen from Tirol before, and it added a nice flavor without adding too much sweetness. Despite not really tasting like castella, this Tirol was quite pleasant, and I wouldn't mind having it again. I'd been actively avoiding this because I'm not a great fan of Castella generally and I didn't want to buy a multi-pack for just this one flavor. I'm glad you reviewed it! I hadn't had Tirol in a while, so I didn't mind ordering the whole pack, but I agree that this flavor isn't worth it if you don't want the others. Thanks for commenting! Yum, sounds good :) I was thinking about getting this one. Which do you think is better this one or the wine one? Hmmm...that's a tough call! As far as authenticity, Castella is better, but I think I like the jelly center of Wine better - even though it doesn't taste like wine! In the end I got the kinako mochi bag of 9.